The National Heart, Lung, and Blood Institute (NHLBI) Guidelines for the Diagnosis and Management of Asthma provide evidence-based best practices for diagnosing, managing, and controlling asthma. 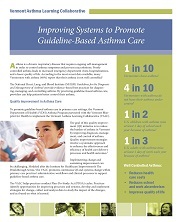 To promote guideline-based asthma care in primary care settings, the Vermont Department of Health’s (VDH) Asthma Program partnered with the Vermont Blueprint for Health to implement the Vermont Asthma Learning Collaborative (VALC). This brief describes the VALC and the approach used to promote systems change within primary care practices’ administrative workflows and clinical processes to support guideline-based asthma care. JSI, 2013.